Click the links below to see the photos and videos. Member Photos: Photos from recent Sunday mornings at SsAM. Photos: Open House on September 30, 2017. Photos: Sharon Bryant’s photos taken on Mother’s Day, 2017. Photos: Great Vigil of Easter, 2017. Two boys were baptized and the Choir School of Delaware sang. Photos: Ken Cowan performs the first concert on the Katherine Esterly Organ, Saturday, February 25, 2017. Photos: The Dedication of the Katherine Esterly Organ. Sunday, February 19, 2017. Photos: 20th Anniversary Tea photos by Sharon Bryant, January, 2017. Photos and Videos: Kwanzaa Celebration, 2016, by Sharon Bryant. Photos, Recording: 25th Anniversary of Fr. Andews’ Ordination. Photos: Carnival Sunday by Danny Schweers. People dress up in festive attire on the last Sunday before Lent. YouTube Slide Show: Photos from 2014-2015 at SsAM as presented at the June 14, 2015 Annual Meeting. Photos: Urban Stations of the Cross — Good Friday Walk on April 3, 2015 organized by Episcopal Church of Saints Andrew and Matthew. Twelve photos by Bob Richmond. Photos: The March for a Culture of Peace was held in Wilmington, Delaware on Saturday, Sept. 27, 2014. Many organizations, including the Episcopal Diocese of Delaware, supported this event. Danny N. Schweers was one of perhaps 300 people who marched. Click the link above to see 80 of the photos Danny took of the event. Photos: Annual Picnic, July 6, 2014. It was a sunny Sunday at Bellevue State Park in Delaware for SsAM’s annual picnic. Photos: Eight confirmed on June 1, 2014. 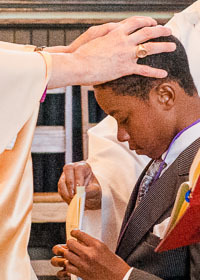 Click here to see 21 photos of the recent service of confirmation conducted by Bishop Wright. Among other things, those confirmed promised to “strive for justice and peace among all people, and respect the dignity of every human being.” Contact Danny Schweers at 302 475-0998 if you have trouble downloading the photos to your computer. Photos: Easter Baptisms by Candle Light, 2013: Click here to see the 15 images. Photographer: Danny Schweers. Music videos by Ken Francis featuring the SsAM Adult Choir. Photos: Service of Appreciation and Thanksgiving for the ministry of the Cathedral Church of Saint John on Saturday, May 19, 2012. SERMON: Click here to listen to the sermon. VIDEO: Click here to see a 67-second video. Video: God’s Video Game. A spur-of-the-moment children’s sermon by the Rev. David Andrews. Click here to see the video on YouTube. Even after he opens The Mystery Box, Fr. Andrews does not know what it is inside it. Then, on the spot, he has to come up with a sermon. Photos: David T. Andrews Jr. was welcomed as our new rector at a celebration on May 23, 2010. Video: “In That Great Gettin’ Up Mornin'” was the processional sung on Carnival Sunday, Feb. 14, 2010. Video: The SsAM Choral Scholars sang William Byrd’s “Ave verum corpus” on Sunday, February 21, 2010.